get your dinner delivered by bike! on saturday nights, between 5 and 8pm, we are offering bicycle deliveries of all selections from our lunch and dinner menu at the cafe. give us a call, order up some dinner, and get your food delivered via bicycle (the greenest transport method). we deliver to the entire Tower Grove area – so call this saturday. our menu is online – lunch and dinner. We have a new show hanging at the cafe that you should check out. Here is some info below and a couple of images that hopefully pique your interest. Showing at the Local Harvest Café from now until late May is the photographic work of St. Louis artist Daniel File. The display is primarily from two series he has put together: Tranche de Vie, which is a color series of image slices about food and water, and Ghosts of the Prairie, which is a black-and-white series of images about the disappearing small family farms of the Great Plains. Viewers will find 21 images ranging from color-saturated ‘slices of life’ to moody, b&w images of family farms, evoking symbols of a society that values hard work, long-term goals, and strong family connections. While the colorful images are a testament to our connection to the healthful food that sustains us, the b&w images remind us that our tangible connection to that source of food may be a way of life that is disappearing. The show even follows you into the restroom where two more black-and-white prints await you. These explore the textures of the stark realities of a late harvest as well as a Missouri winter river bank. Dan File has enjoyed successful careers in acting, theatrical design, and education, but his vision is most fundamentally expressed in his photography. Dan’s photographic work has been seen in galleries in Illinois and Missouri and hangs in several commercial establishments. Recently he was commissioned to produce several architectural prints for the internationally renowned Kansas Cityarchitectural firm of HNTB. His images are even featured as a “Structure Series” of architectural jigsaw puzzles by Publisher Services, Inc. in Atlanta, Georgia. All the hanging framed prints are for sale, and unframed prints can be purchased from the artist. 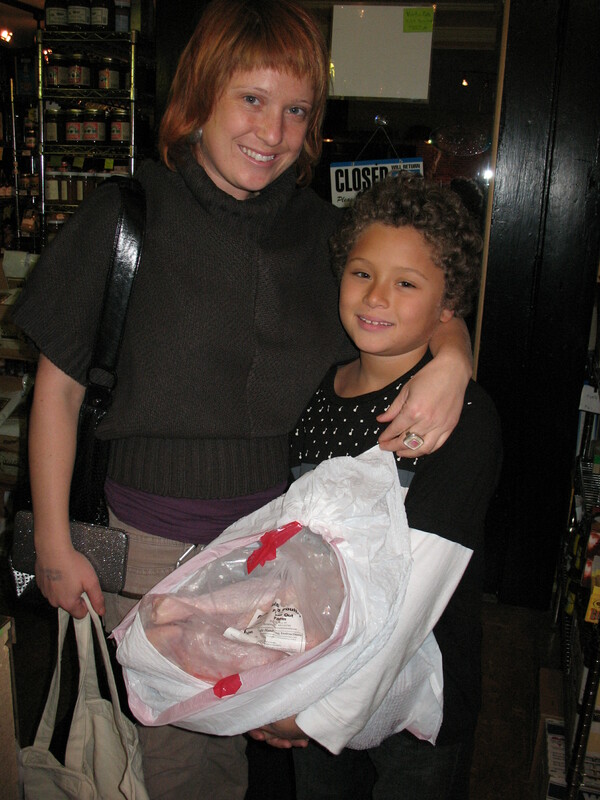 Sarah and her rockin' son graciously pose with their prize turkey. It’s 4:00p.m. Sunday afternoon and Brian from Farrar Out Farms is scouting our back alley to make sure the large refrigerated Ryder truck he’s rented for the turkey deliveries will actually fit without taking out any wires. Luckily for all of us, turkeys included, the truck fits and the unloading begin. We’ve arranged to stay open late so our turkey buyers can come to pick up the 80 turkeys we sold this year. It easily could have been 100 had Farrar Out had them to sell. I never thought I’d be so excited about fresh turkeys, especially given the fact that I was a vegetarian for 18 years, but there I was anxiously anticipating the arrival of our customers and the turkeys. Brian and the two guys he brought with him, Mark, Pat, Anne, and I start the unloading. Brian recounts that it had been a hard week. Not only is it hard work to slaughter and process so many turkeys, but the cold weather the past week had made it that much harder. A few minutes after we unload, the people start arriving. I don’t know if they felt this way, but I felt a great sense of community. It was fun being the deliverer of the turkey–the prize of the meal. It was fun watching people visit and watching them prepare for the meal to come. It reminded me that lots of people really do want to be connected and do want to know where their food comes from. And it reminded me again to contemplate all that happened so that I could eat– the seeds that were planted, the hands that harvested it, the little tiny things in the soil (microorganism? right?) that nourished it, the farmer who tended the animal, the animal who lived so that I could too, and in thinking about this I am grateful.